Around here, we tend towards playing more complex games. Games that require some planning ahead. Games that you need to concentrate on. But sometimes, these games are not appropriate. Maybe it’s already three in the morning, but you don’t feel like stopping yet. Maybe you’re with friends you didn’t see for a long time and would rather catch up while playing instead of exchanging “Got wood for sheep?” and the associated jokes. Or maybe you just want to relax and play a game that you can enjoy over beer and pretzels. Wait. Beer? Pretzels? Wasn’t there that one game, by that one guy…? Yes, there was that one game called Beer & Pretzels by Ted Alspach. This year’s Essen release has the less pub-suitable and more thermodynamics-challenging – and also longer – title Ted Alspach’s Perpetual-Motion Machine. Perpetual-Motion Machine has nothing in common with Beer & Pretzels and its coaster tossing, but it does give you Ted’s new take on the game most commonly played over beer and pretzels: Poker. Now, of course we all know that perpetual-motion machines are impossible, they violate the either the first or the second law of thermodynamics which read: “Thou shalst not create energy” and “Thou shalst not keep all thy energy to thyself”, respectively. Nevertheless, about once a year or some previously unknown company or inventor pops up with yells of “We built one! We built one!”. Ted Alspach’s machine is joining that long line of failed experiments, and your job is to help him increase the efficiency of his prototype machine until it’s motion is really self-sustained (or at least the public believes that it is). To do that, you place components into your machine, meaning little wooden cubes on your player mat. If you’re unlucky like us, the step before that will be to hunt around for 60 to 80 small wooden cubes, because your copy of the game came with cubes not included. It’s a bit vexing, but in a game-addicted household, it’s not a huge problem either. Anyway, your mission – should you choose to accept it – is to place a pre-determined number of components into the machine, which generally make the machine more efficient, which generally makes it easier to place more components. What does that have to do with Poker? You add components to your machine by completing Poker hands. Since you start the game with three cards, and three cards is generally too few to poker, the first action you can choose on your turn is: take more cards. Initially, you can take exactly one card from the four that are face up. 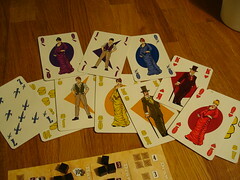 Later in the game, this can be up to four plus up to three cards face down. Your initial hand limit is five cards, so just enough to get all the poker hands you ever wanted and never got when you play for money. Your second option is to get more cubes. Your wooden cubes come in two supply piles: your general supply pile and your personal supply pile. To put cubes onto your player mat, they have to be in your personal supply first. Think of it as buying components before you can enhance your machine with them. To get cubes from your general supply, you have to discard cards: one per cube, and in the beginning you can only buy one cube per turn. Two Pairs: this is the lowest you can get, one pair gets you nothing. Two Pairs let you place two cubes on your mat, but without any beneficial effect. Three of a Kind: this is the lowest hand that gives your machine an upgrade. For every level in three of a kind, you can exchange an additional card for a cube from the general supply when you choose that action, up to 6 cubes at once. Straight: Collecting cubes for straights increases your hand size, up to 10 cards. Straights and Flushes still consist of 5 cards only, so you can have leftovers. Your hand size is also the maximum number of cubes in your personal supply. Flush: increases the number of face down cards you draw when you draw cards. You need one cube here to get face down cards at all, two more cubes get you two cards and another two three cards. Full House: Cubes in the Full House area increase the number of face up cards you can draw, up to four cards meaning all open cards. Apart from those 5, there is three more hands to play. a Straight Flush lets you place cubes in the Straight area and the Flush area at once. A Royal Flush lets you do the same, but the cubes may come from your general supply. And finally, Four of a Kind counts as two pairs, but again the cubes may come from your general supply. The four areas with improvement all get bigger on the top: the fifth level of each takes three or even four cubes, which you need to have in your personal supply of course. This makes concentrating on one or two hand a good strategy, if only for that reason. Especially concentrating on Straights and Flushes and then finishing both with one Royal Flush is really worthwhile since it lets you place six cubes from the general supply. In theory, at least. Even though assembling a Royal Flush here is much easier than in Poker, I still didn’t have any success in trying to pull this off. There is little advantage in any of the improvements over the others, and before the game is over, you will have some cubes in all of them anyway. So your best strategy is, in almost all cases: aim for the most likely hand you can get with the cards you have, and play it as soon as you get it. Another important strategic advice: if you would have to discard after drawing more cards, and have cards that you’re fairly certain will not make a hand, buy cubes. It’s very frustrating to discard cards you could actually use because you ran out of cubes. And that is as far as strategy goes in Perpetual-Motion Machine. The one decision you make every turn is: which of the three actions do I pick. It may not always be obvious which one to pick, but it often leaves you with the feeling that it didn’t matter much. The one big decisive factor in this game is good old luck. In the beginning, you can get around that a bit by paying attention to what the others are collecting and snatching up the cards they would want. But from the middle of the game, this becomes pointless since a) they’ll be drawing cards face-down, b) their hand limit is high enough that they can create a hand with any card, and c) you’ll be picking up all the cards on your turn, anyway. From that point on, it’s just drawing the right cards and the very minor issue of keeping your personal supply stocked. From that point on, it’s also an exercise in card shuffling. 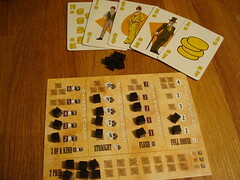 On their turn, every player is taking up to seven cards, a turn is over in just a few seconds, so you’ll be shuffling about, oh, once per minute or so. It’s not a big deal, but you shouldn’t bring Perpetual-Motion Machine to the office to cheer up your co-workers who are suffering from carpal tunnel, that’s all I’m saying. I also don’t want to complain about the big amount of luck needed to win too loudly. After all, what I was looking for in the beginning was a game that doesn’t require a lot of concentration and can thus be played while chatting, knitting or watching the super bowl. In that category, Perpetual-Motion Machine delivers a fun experience. The home stretch is usually very tight, so players can be engaged to the end and then do the typical “I would finish on this turn, too!” groans.I would have preferred if the game was a bit shorter, or alternatively if it had more player interaction to keep things interesting. As it is, you just spend slightly too much time sorting through your own cards in the end – remember, you draw up to 7 fresh ones at that point – that could be spend doing something that has an influence on the others. On the other hand, at least it’s nice to look at, the cards are not just a standard poker set but have a nice beginning-of-last-century style, and I’m sure the wooden cubes would have been of amazingly high quality, if they had been present. So, if a relaxed way to spend half an hour while drinking with your friends is what you were looking for, Perpetual-Motion Machine might be for you, but don’t expect it to replace either a more involved board game or the weekly Poker night with your buddies any time soon. On an unrelated note, I dare everyone who sees this to design a role-playing game around this poker-hand collecting and placing cubes mechanism. Maybe something with drawing cards in specific situations and collecting hands to either improve your character attributes or add points to a pool that you can use later. No idea if it would work, just something that occurred to me because I was reading about unusual randomisers in RPGs. World War 3 has come and gone, and to everyone’s surprise we’re not extinct. But the planet is not a great place to live any more, except for those select few that secured a space in the Golden City, the last beacon of civilization in the world. All the wastelanders want to live there, and the players in Raid & Trade actually have the chance to achieve that dream, if they find the right mix between cooperation and ruthlessness. We find ourselves in a not-so-far future. The whole world is controlled by a totalitarian government. Only a small resistance group is desperately trying to free the people, but their time is running out: they have already been infiltrated. The Sahara desert. Wide, open spaces. You can travel for days without meeting another soul. So why is it that, when playing Targi, there are always people standing where I want to go? Always. Every single turn. But they are complaining about the same thing, so it’s perfectly balanced. Small and quick games – we don’t write about them much just because they are small and quick. But we all play them. Between other games. Before dinner. Sitting in a pub waiting for people to show up. And then, sometimes, we do write about them. Dominant Species is on the upper end of long and heavy games for us – not something you unpack at the end of the gaming night, just before people go home. There is a lot of depth and a lot of detail to explore here. Anyone who grew up with a sibling will know the situation: there is ice cream, or cake, or something to be had, one of you had to split it and the other one would get first pick. As it turns out, that system not only works for ice cream but for exploring space ships as well, because that’s how you get your actions in Andromeda. Creating magic potions and elixirs isn’t easy, we all know that since a certain young wizard had to struggle through his Potions classes. But being able to create them yourself does have a certain appeal, doesn’t it? It’s time for Potion-making practice.